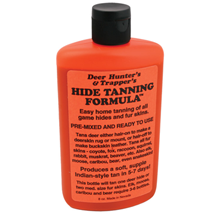 Trapper's Hide Tanning Formula (HT00071) Northern Sport Co.
- Easy home tanning of all fur skins, deer and other big game hides. Pre-mixed and ready to use. Produces a soft, supple Indian-style tan in 5-7 days. One 8 oz. bottle will tan two medium size fur skins or one deer hide. Elk, moose, caribou and bear require 3-6 bottles. Complete instructions included.